This article is about Murraya koenigii, a tree which produces an aromatic leaf often used in Indian cuisine. For the European plant sometimes referred to as curry plant, see Helichrysum italicum. 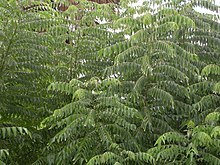 Its leaves are used in many dishes in Indian subcontinent. Often used in curries, the leaves are generally called by the name “curry leaves”, although they are also literally “sweet neem leaves” in most Indian languages (as opposed to ordinary neem leaves which are very bitter and in the family Meliaceae, not Rutaceae). The small flowers are white and fragrant. The species name commemorates the botanist Johann König. The genus Murray commemorates Swedish physician and botanist Johan Andreas Murray who died in 1791. ^ “Murraya koenigii“. Germplasm Resources Information Network (GRIN). Agricultural Research Service (ARS), United States Department of Agriculture (USDA). ^ a b Henry, Trimen (1893). A hand-book to the flora of Ceylon. London: Dulau & Co. p. 219. Retrieved 1 August 2015. ^ a b c Norman, Jill (2002). Herbs & Spices: The Cook’s Reference. New York, New York: DK Publishing. pp. 212, 213. ISBN 0789489392. ^ a b c d “Curry Leaf Tree (Murraya koenigii)”. Heritage Garden. Retrieved 2019-04-02. ^ a b Rashmee Z Ahmed (30 September 2004). “Traditional diabetes remedy offers hope”. The Times Of India. ^ Sankar Ganesh, Ravishankar Rai; et al. (2015). “In vitro antibiofilm activity of Murraya koenigii essential oil extracted using supercritical fluid CO2 method against Pseudomonas aeruginosa PAO1″. Natural Product Research. 29 (24): 2295–2298. doi:10.1080/14786419.2015.1004673. ISSN 1478-6427. PMID 25635569.